Rarely is a photo coming out of the camera so good that it cannot be improved. Photo managing and editing programs provide a variety of tools for helping to get the best image out of every photo. Two effects in Picasa have become mainstays in my “quiver” of tools that I reach for when my initial edits don’t quite reach the “sparkle” I wanted. The effects are “HDR-ish” and “Boost”. The modified image is on the left, the original on the right. Note how the colors appear brighter. This can help a lot of photos. The “Strength” slider sets the amount of "Boost”. Going too far will make the picture look unnatural and gaudy, so use it with great care. The “HDR-ish” effect is even more easily misused. The “HDR” part of the effect’s name refers to “high dynamic range”, a technique that normally requires several exposures of a scene which are then combined with the dynamic range, the darkest parts to the brightest areas, toned done so the highlights still show detail and the shadows are lightened to show what’s in them. 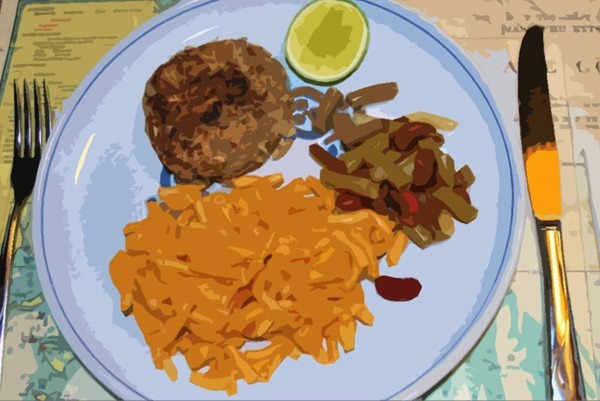 The technique is often overdone with the result that the picture looks more like a drawing than a photo. 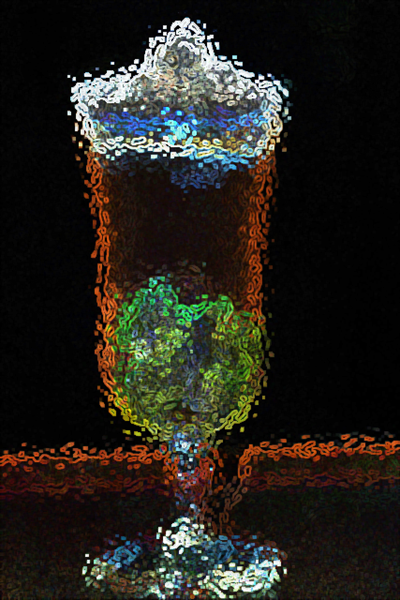 The Picasa “HDR-ish” effect emulates that garish look. Here is the same photo with the “HDR-ish” effect applied rather heavily. Note how the lighter clouds are surrounded with a dark edge and how the green trees now have a white halo around them. Clearly for this photo that is too much – unless you want such an effect for some special reason. The “Radius” slider defines how wide the halo effect is and the “Strength” slider controls just that, the strength of the effect. With the “Radius” slider almost all the way to the left, just off the peg so to speak, the halos will be very narrow and almost invisible. However, the effect will sharpen the photo noticeably as you can see in the next illustration. In the above illustration the “Strength” slider is on the high end and this will cause uniform areas to show “noise”, a grainy appearance like sand on a beach. For best results the strength needs to be applied carefully, rarely more than half-way up. Below are photos that were made sharper and brighter with these two effects. You can see that this technique might be something that you can also use to bring out the best in some of your photos. As many of my readers know I like sourcing photos from SkyDrive. This article explains some of the details of how I manage my SkyDrive albums and my photo blog, Gallery Ludwig. The SkyDrive Desktop App makes the SkyDrive look pretty much like any other folder on the computer. Updating a SkyDrive album is just a matter of dragging the photo or pictures to the folder. That can be done just as easily using SkyDrive in the browser, but with the Desktop folder not just files but folders – albums – can be copied to SkyDrive. Of course, any subfolder can be the destination, just like copying or moving stuff around on your computer. Like other files on a computer, the order of files inside a folder cannot be customized when using the SkyDrive desktop folder. However, using the SkyDrive in a browser provides the Rearrange option – a drag-and-drop feature. You can arrange your SkyDrive photo gallery just the way you want, with the individual photos in just the order you like. As a “front end” or “lobby” to your gallery you need another site. I like using a photo blog for this. You can build some nice pages and have a blog post page showing the latest additions and any stories you would like to tell. The photo blog is, of course, managed using Windows Live Writer. There is no better blogging tool. The Insert > Photo album feature can place nice link arrangements on a blog page or post. Just take a look at Silver Canvas – Gallery EXP 2. But even a single photo with a hyperlink to your album will be a fine “front end”. Let me explain that a bit more. I use an album called Gallery EXP as one of my SkyDrive prime galleries. Inside this album are albums, folders for various topics. When a visitor gets to this album the tiles for the sub-folders show little slide shows of the contents. I think this is pretty neat. Here is a still photo of my gallery. Click the image to go to the live one. Getting the link for the albums and photos is just a little bit complicated. 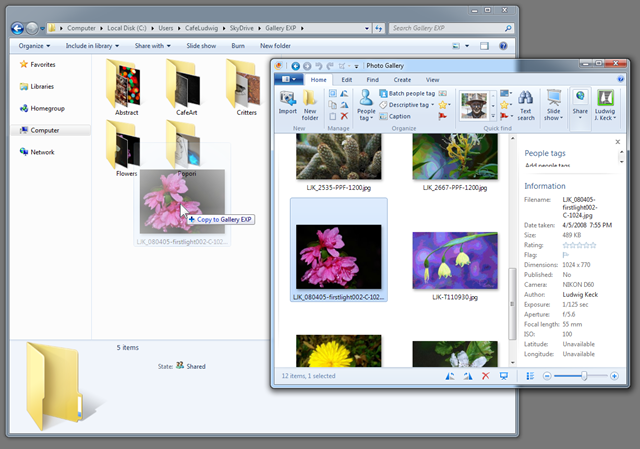 For the prime gallery, sign in to your SkyDrive using the browser version. Navigate to your “prime gallery” folder. Click the little “details” icon to open the information pane on the right side. Click Sharing then click Share folder. In the next dialog click Get a link. Then click Make public. You will now see a somewhat long URL in the address box. Copy this URL and file it so you can use it in the future to provide links to your gallery. You can click the Shorten link to get a short URL. You can see my short URL for Gallery EXP when you move the pointer over the image above. You can similarly obtain URLs for any folders in your gallery. 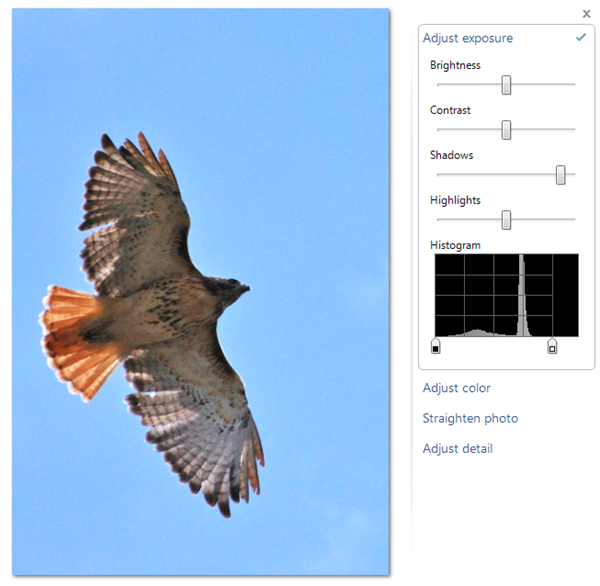 Navigate to the newly added photo in SkyDrive (not in the desktop folder, this requires the browser version). Click View original in the top taskbar. This gets you a view of the photo on a separate page. 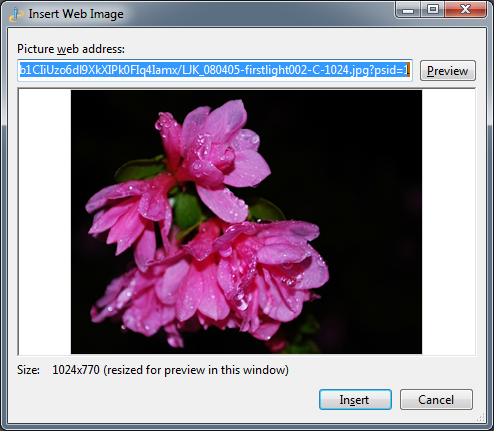 The address in the browser address field is the URL for this photo. It is rather long. Copy it and file it away. When you insert a photo in Live Writer – Insert > Picture > From the web… this URL will allow you to source your actual photo and show it in your post. Of course, you can see it better by clicking the image to go to that post. Be sure to click Latest in the menu bar to see the most recent posts. And don’t be shy about clicking the Gallery EXP link, it gets you to my gallery. WordPress recently announced updates to the way media is managed from the blog dashboard (Manage Slideshows and Galleries — All in One Place). 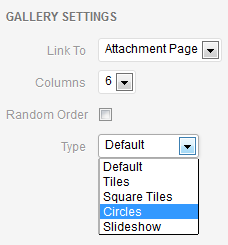 This makes using slideshows and inserting galleries in blog posts and pages much easier. For preparing posts and pages in a fast and easy WYSIWYG (what-you-see-is-what-you-get) manner, nothing beats using Windows Live Writer. Live Writer also offers neat gallery access via SkyDrive photo albums. So can both be used together? Unfortunately, Writer doesn’t know about WordPress slideshows or galleries and has some editing quirks. The WordPress editor doesn’t understand the intricacies of the Live Writer “Photo Album” and tries to “optimize” the code. So between the two of them it is a delicate operation to get them to play together. You can see that WordPress slideshows and galleries can be combined with Live Writer photo albums on my Gallery EXP page at Silver Canvas. True, in the kitchen you should never use all the spices at once, and this is probably true in building a photo gallery blog as well. But my page is an exception, of course, as I am testing the gallery features of both WordPress and Live Writer. You can imagine that when WordPress again gets a hold of this, the gallery won’t look the same. Now the WordPress editor also attempts to correct and optimize code. When it gets a hold of the large set that defines the images and links of a Live Writer “Photo Album” insertion sometimes strange, and not necessarily beautiful things happen. Especially insertions with individual thumbnails and links, like the one here, get mangled pretty badly. They get progressively more damaged on repeated use of the WordPress editor. The strategy for getting an acceptable page or post is this: Plan ahead, minimize the use of the WordPress editor, and don’t make revisions. 1) Plan ahead – Sketch out your post or page, note what photo albums and galleries you wish to include. Organize the photos for the albums and galleries. 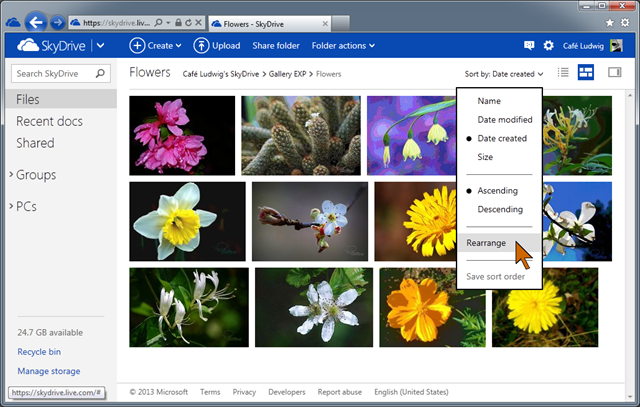 2) Upload your SkyDrive albums – Set up the SkyDrive photo albums that you wish to include in the root of your SkyDrive. Live Writer cannot find sub-folders. 3) Start in Live Writer – Start the page or post in Live Writer. Include all elements and text, and any simple insertions. 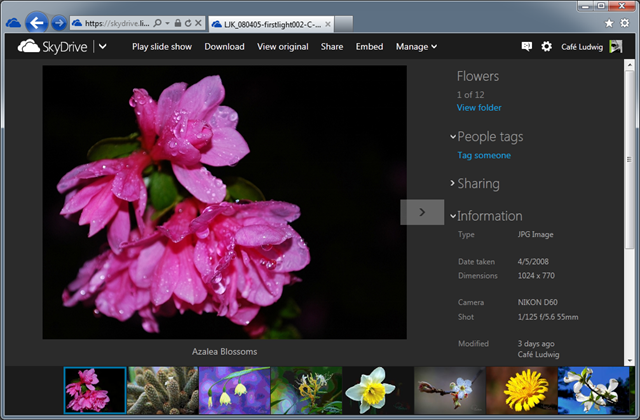 Insert the SkyDrive photo albums and pick the album styles and other features. Live Writer provides a nice selection of thumbnail layouts, “Album styles”. 4) Publish to blog – If you are working on a page go ahead and publish it. 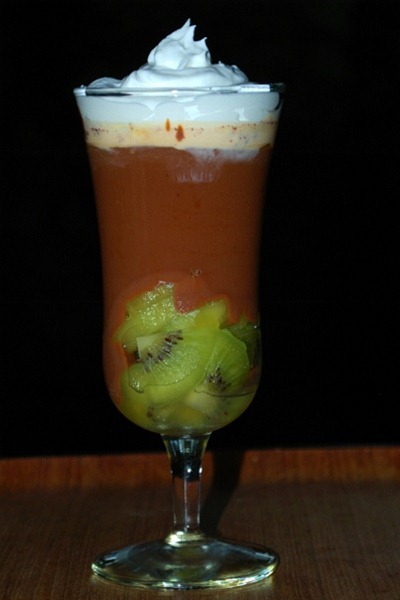 Since it is new it will not be included in a customized menu. If you are working on a post, select “Post draft to blog” so it will not be published immediately. 5) Edit in WordPress dashboard – Once the page or post has been uploaded the next step is to add the WordPress features – slideshows and galleries – that are not available in Live Writer. Pretty nice. Click a thumbnail to select it. Only problem is the identification of the thumbnails. You can’t tell which image you are dealing with until you click it. The pane on the right gives the details. Since the Media Library will be filled with many thumbnails and full images, the selection process is a bit cumbersome and time-consuming. The procedure to get a gallery onto the page requires Create Gallery > Update Gallery > Update (page). The options for the type of gallery, Default, Tiles, Square Tiles, Circles, Slideshow, is a bit temperamental, and the interaction between columns and type – it it exists at all – is not obvious. Re-arranging the pictures within a gallery is a quick drag-and-drop. Still, WordPress galleries are nice. The slideshow works but the window size is not adjustable. The neatest gallery arrangement is “Tiles”. There is no control over the arrangement, but it is always pleasant. For all galleries (but not Slideshow), clicking leads to a black-framed large image. A good way to view the pictures. Updating the mixed gallery can get tricky. If Live Writer is used the WordPress Galleries are messed up. If the WordPress editor is used the photo albums inserted by Live Writer may get spoiled. The WordPress galleries can be easily maintained and modified in the WordPress editor. Clicking the Edit Gallery link in the gallery placeholder opens the Edit Gallery page which allows re-arranging, deleting or adding to the gallery, as well as changing gallery parameters. “Add to Gallery” can be done from the Media Library or by uploading. Uploading would be the preferred method – it is also a drag-and-drop process and avoids the confusion posed by the Media Library. The only downside is that Live Writer Photo Albums might get mangled. Maintenance on the Live Writer Photo Albums is a matter of updating the corresponding SkyDrive album. That is a snap, especially when using the SkyDrive Desktop App. Just manage the folder like any other folder on the PC and let the app do the updating. Even relocating the album will not affect the operation of the blog post or page – it will continue to work just fine. If you don’t mind the occasional update headache, combining the features offered in Windows Live Writer and the WordPress online editor can lead to some gorgeous looking photo galleries. Sometimes you may be happy with a photo – perhaps a flash photo of friends, or a photo of a bird against the sky, like here. Flash pictures often show the people in the front row just fine, but the ones in back are dark and hard to even recognize. Photos of back-lit subjects might make nice silhouettes but are a little too dark to show all the detail. Cameras do a marvelous job of taking the work out of photography, but you can improve the photos more often than not after they come out of the camera. Here is a photo of a hawk. The sun was high in the sky and what we see is the shaded side. Not a bad photo you might say – considering the luck in getting it. You can see the red tail feathers and nice detail in the wings. The camera did a pretty good job. The dark areas, almost black in this shot, may contain more detail than is apparent when the photo is seen on a monitor or even printed as is. 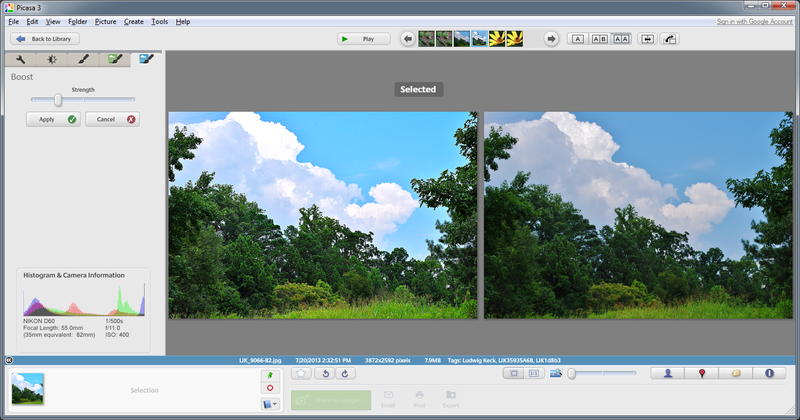 Windows Live Photo Gallery makes it easy to improve your photos. Clicking Auto adjust lightened the dark areas a bit – it was a good improvement. The manual adjustments can make it even better. 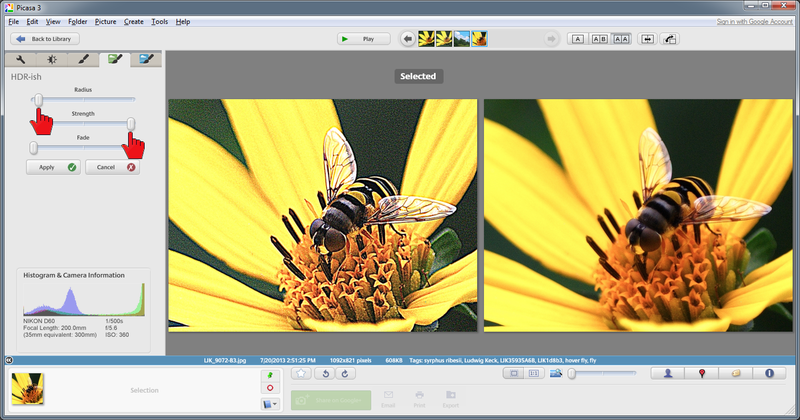 Photo Gallery, in the Adjust exposure panel, has four sliders and also two histogram controls. Brightness affects the whole photo and makes it either lighter or darker. The Contrast control can make the dark areas lighter and the light areas darker or vice versa. The Shadows control only affects the darker areas, it can lighten them or make them even darker. 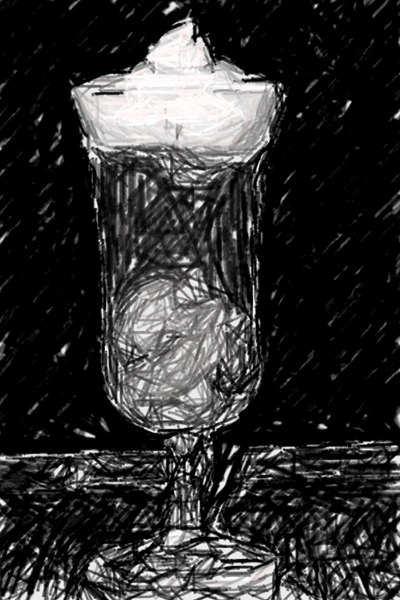 The Highlights control works similarly but affects the lighter areas. For this photo I set the Shadows slider almost fully to the right to lighten the dark, the shadow, areas. The histogram shows the distribution of the pixels from full black on the left to full white on the right. The vertical scale shows the relative number of pixels of that shade. 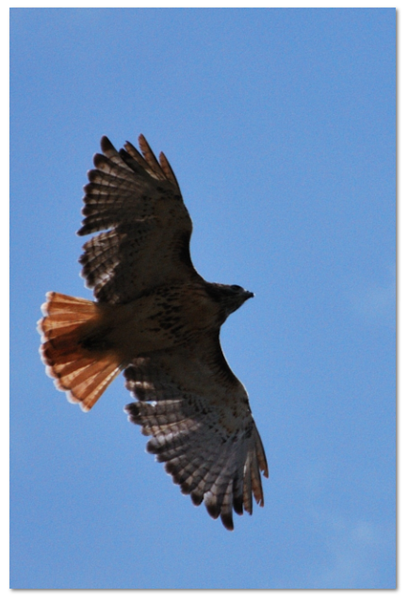 Note that in this photo of a hawk against a blue sky there are two humps or curves. The low, spread out curve on the left shows the pixels of the hawk, the big spike is the blue sky. There are two sliders below the histogram. The left one lets you set the black level. Slide it to the right and every pixel that is to the left of the indicator will be set to black. The right slider lets you set the white level. Every pixel on the histogram that is to the right of the indicator will be set to full white. The nice thing is that once these settings are applied, the pixels between the slider settings will be spread out over the full range from black to white. For this photo I moved the white level slider a ways to the left. There were no pixels there, so I did not turn any areas into chalk white. The effect was to spread the pixels out, lightening the photo and the sky. There is no best setting for any of these controls, just play with them until you are happy with the results. I click Revert to original quite often to permit me to start all over. Enhancing your photos is fun to do. It is even nice when your friends say that you take good photos. The photos here are just for fun. As such no elaborate efforts were employed, not even a tripod. When flash was used, it was on-camera flash, with just a paper napkin as a diffuser in one of the shots. Mind you, my dear reader, Café Ludwig is a blog, not a place to eat, so, no reservations, please. 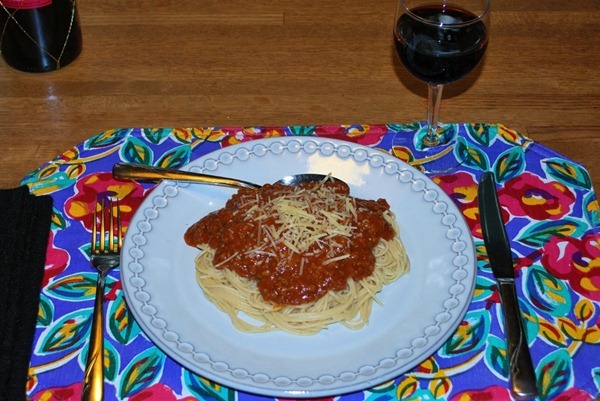 How about spaghetti tonight? With a pleasant little chianti? 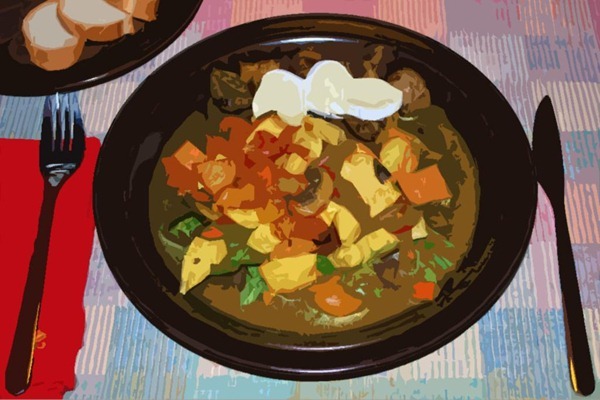 Or maybe a chicken curry? 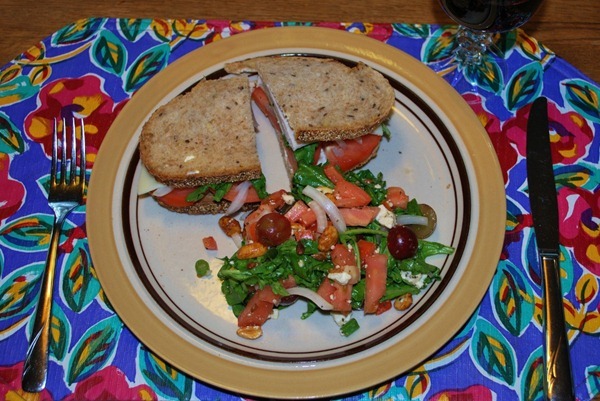 Just a sandwich, perhaps? Or a “hurricane” dish – pantry food! The Background Remover needed just a little help around the plate – maybe a couple of minutes at most were spent on “lifting” the plate. 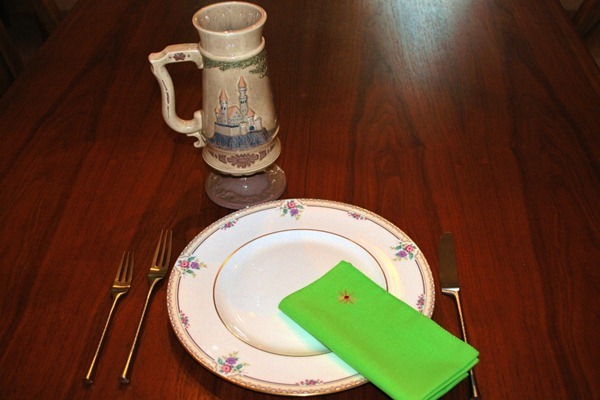 A rectangle shape with a texture fill serves as the new placemat. How about a couple of posters for Café Ludwig? 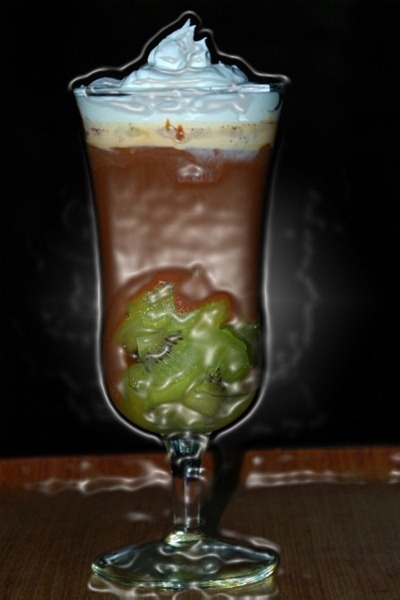 Just one “fruit-on-the-bottom” pudding – all these artistic affects – you have also seen a version in the banner at the top. 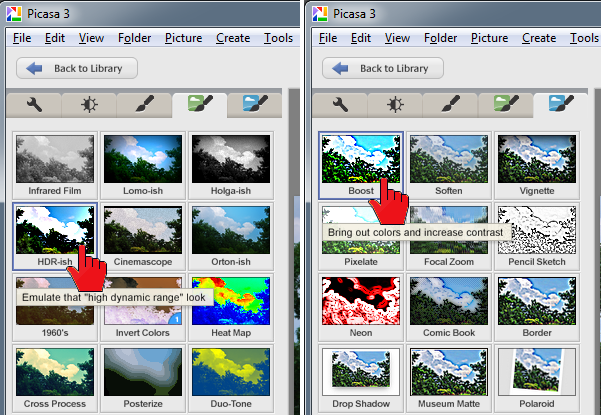 Microsoft Word 2010 shares these “Picture Tools” with Excel 2010, and PowerPoint 2010. 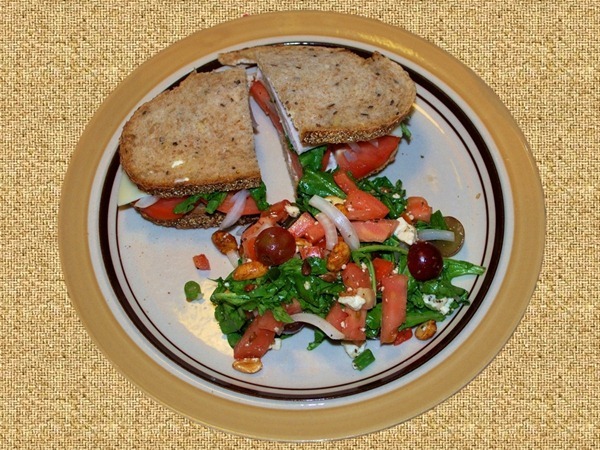 Always handy when you want to play around with your photos – or your food. The banner was made only partially in Word, the capital letters were customized in Paint.